So often, we look to either side of us and compare how we are doing with others. We want to use their life as a yardstick for ours. That is quite treacherous. It leaves open the door for the thief to steal the joy that we might find in our own lives. As I prepare my heart for these next couple of months of holidays and celebration, I long to not trap myself in the maze of comparison, especially with my family and friends. In the end it just makes me resent them and be frustrated about my own life. Often times, this creates disappointment or let down after the holidays and perhaps a stint in the prison of despair. In our own comparison, we often forget that others are doing the same. We are sometimes so worried about how we measure up that we miss the important moments. When I was in college, some of my best friends and I all led bible studies for freshmen women. We met together right before the bible studies to prepare. It was one of the most isolated times in my life. I always felt like they were doing a better job than I was. A year later, we were talking about it and someone admitted that they always thought everyone else was more successful than they were. All of our mouths dropped and we all admitted to thinking the same thing. That situation actually made me so sad. Imagine what our time that year would have been like if we would have stopped comparing and competing with each other and really enjoyed our friendships. There it is, the act of comparing ourselves with each other, stole the joy we would have experienced together. 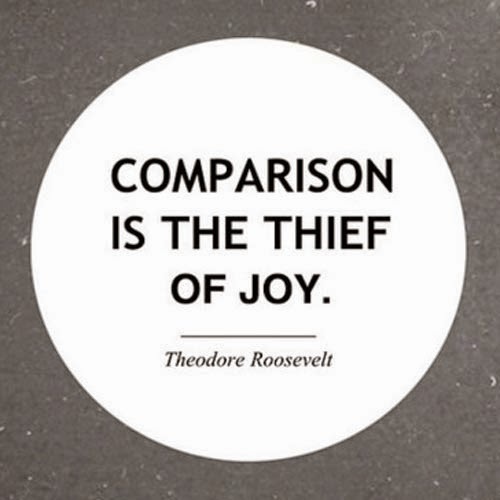 Comparison isolates and feeds insecurities and fears that we didn’t know we had. I have spent many years, comparing my life to others, trying to live up to, or be on pace with other people. So many times, I have lost my way in that. I distracted myself from what God is truly doing in my heart and mind. This has only led to disappointment and despair. In my isolation and insecurities, I have made desperate attempts to salvage what I thought was a ruined life. This only left me even more broken. But in my own sin, I see their life as better than mine and I sit here wishing and hoping for the day that I might do the same. I waste my precious hours of coffee shop time comparing my single life to their supposed happy couple life. Who knows, maybe this is the only time they see each other during the week. Maybe they are just friends. In our comparing, we assume the best of others and the worst of ourselves. I do it all the time, as I run, watching other runners run with ease and I struggle to push past my 10:00 min/mile pace. I do it when I walk in to my best friend’s home and it is clean and tranquil, with curtains, and nice furniture, reminding me of my craigslist finds and my shared space with roommates. In those moments of comparison, all I am doing is making my life seem worse, I am inviting the pity party! I am inviting the thief in to destroy any joy I have about my current life situation. However, if we name comparison that, a thief, perhaps that frees us to run away from it and lock the door to its attempts to steal from us. In this we can also find comfort, we aren’t the first to compare, and we won’t be the last. But Jesus nails this spot on, “If is my will..” Right, we have to look to will of God to realize that our lives aren’t meant to be the same. Now, 7 years later, looking at my friends’ lives and mine, I see how beautifully God has worked in unique ways! We have beautiful stories of mercy, grace, redemption, and none of them the same! Friends, I urge you to resist comparing your life, your path, your faith, or even your holidays to others. It never ends well, and will only leave you void of joy. Rejoice in all that God has given you and look to him to satisfy every unmet need. What a great thing to focus on at the beginning of this season. Thanks so much for your honesty and insight, Larissa! I think also that there is a flip side to comparison. People also compare lifting up themselves, putting others down, and consequently putting God down, too. Regardless of who is being lifted up or put down, it is all in vain and sinful if God is not the one ultimately glorified.